Lead Success, Don't Manage Failure! Embarking on the Service Management path requires executives to be fully committed to the cultural transformation they are asking of their organization. They must be active participants in that journey much like the captain of ship in rough waters. They cannot be bystanders mailing in instructions from afar on how to avoid the turbulent waters, an approach that will surely run the ship aground. In our session, we will discuss some challenges that organizations encounter when implementing a Service Management strategy while identifying tell tale signs of where a program might be going astray. We will talk about how crafting the delicate balance between People, Process and Technology can be the difference between success and failure. Lastly, we will review some tactics that will help to avoid making classic and typically fatal program mistakes. 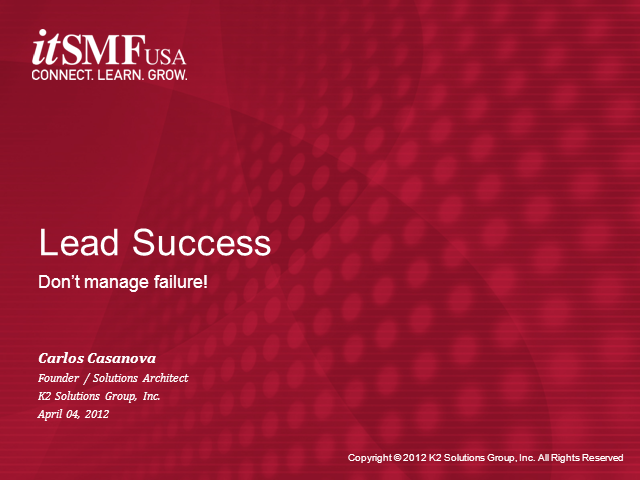 Title: Lead Success, Don't Manage Failure!